Bus from Alor Setar to Shah Alam is an important direct bus service to connect residents between two cities. 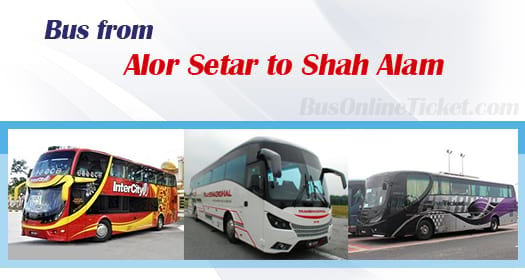 Many residents rely on this direct bus service from Alor Setar to Shah Alam is because by taking train or flight from Alor Setar to Kuala Lumpur requires passengers transferring city bus or taxi from Kuala Lumpur to Shah Alam. Intercity Coach, Transnasional, Sri Maju Express and Eltabina Express are few bus operators operating bus from Alor Setar to Shah Alam. Sri Maju Express is the dominant player among them by providing 4 daily trips. Their combined trip have total up to 8 daily departures. The first bus service starts in the morning 10:45am and the last bus service is at night 11:45pm. The travel time required from Alor Setar to Shah Alam by bus is about 6.5 hours, on average. Please note that in Malaysia there is no bus with toilet on board, so there is one stopover for washroom break. Passengers can always request for additional washroom break from driver during the journey. The bus ticket price for bus from Alor Setar to Shah Alam is costs in a range of RM 49.40 to RM 53.00 depending on your selection of bus operator. The pick up point in Alor Setar is located at Alor Setar Bus Terminal while the drop off point in Shah Alam is conveniently located at Shah Alam Bus Terminal in Seksyen 17. Booking your bus ticket from Alor Setar to Shah Alam via BusOnlineTicket.com is convenient, easy and reliable. BusOnlineTicket.com accept many payment options such as credit card, internet banking, Paypal, Alipay and many more. Confirmation of booking is instant upon payment is made.